I love Hungary. Such a beautiful country with wonderful people and delicious food. Budapest is an amazing city. That stunning bridge crossing the Danube, the Fisherman’s Warf, the markets, the classic Viennese-influenced architecture… I think it’s one of the most beautiful cities in Eastern Europe, if not the most. Most people seem to emphasize Prague and it is a tourist hot spot in Eastern Europe. But while Prague most certainly is a gorgeous city, I prefer Budapest hands down. 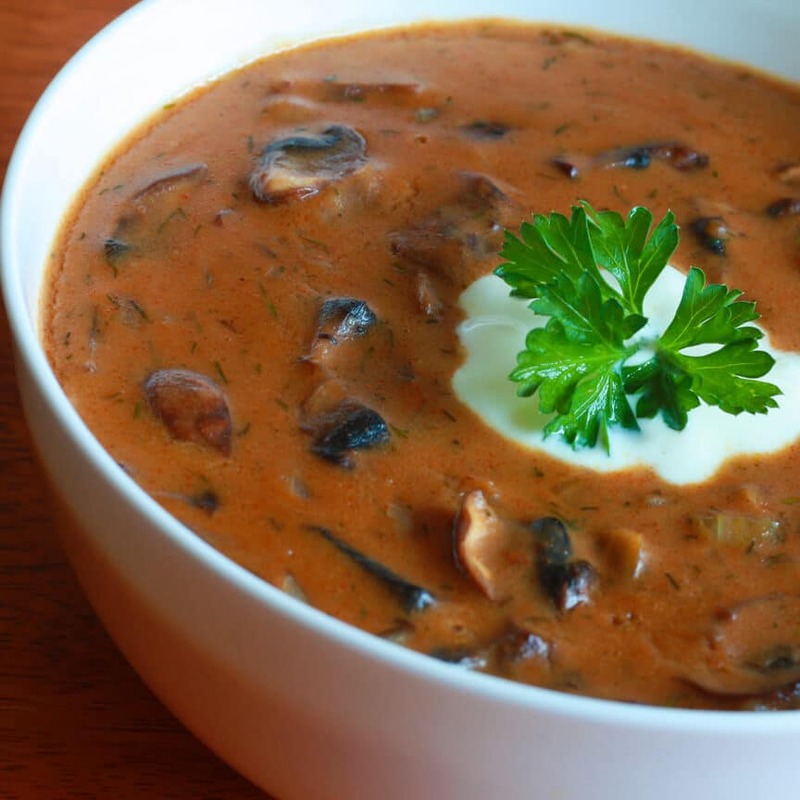 Here is a heavily Hungarian-influenced mushroom soup that we’re sure you’re going to love. 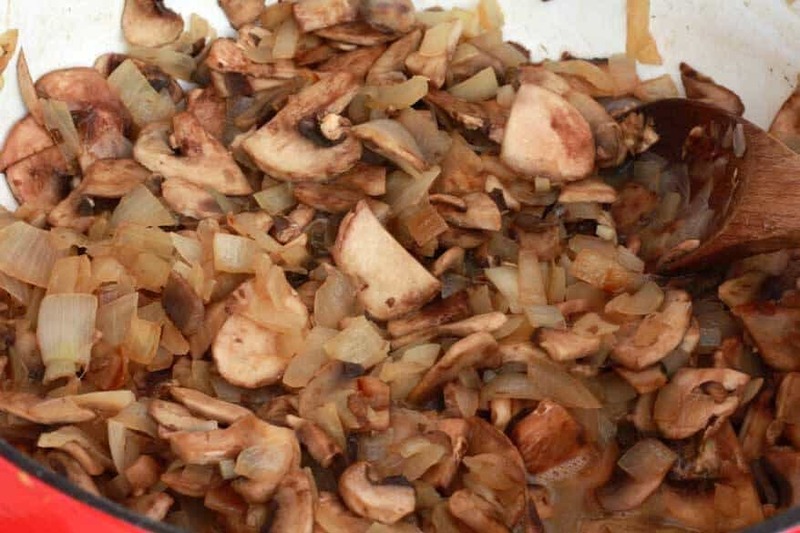 Onions and cremini mushrooms are caramelized in butter. A separate rich roux is made with butter and flour (this adds a world of depth and flavor to the soup). A heap of paprika is then thrown in along with the delicate flavor of dill and a variety of other ingredients that combine to make this a guaranteed hit at your dinner table! Very important to this dish and all Hungarian paprika-based dishes is the quality of the paprika. There are a lot of paprika powders on the market but very few of them actually come from Hungary. Use quality, real Hungarian paprika. There’s no comparison in flavor. We recommend this genuine Hungarian paprika from the Kalocsa region of Hungary. It has an extraordinarily rich flavor and an exceptionally vibrant red color. Many of our readers have tried it, written back and agree that quality Hungarian-imported paprika makes all the difference. This is a stunningly rich and satisfying soup. 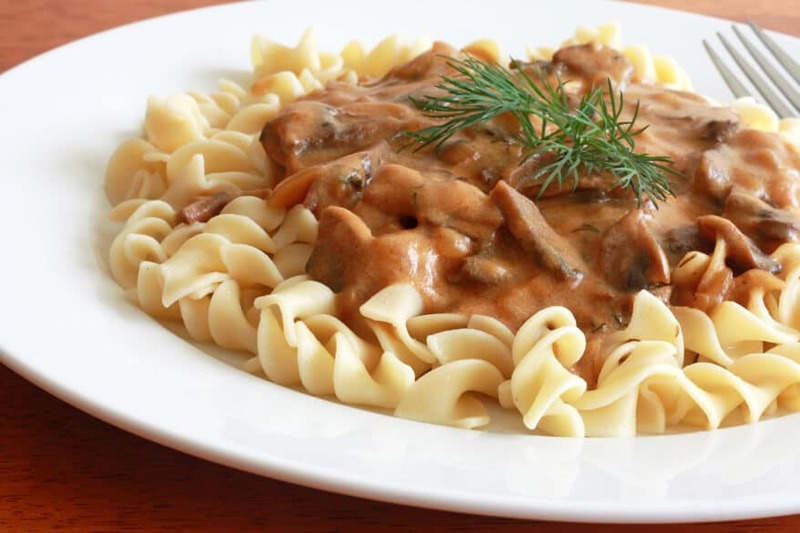 And it’s also incredibly delicious as a creamy sauce over egg noodles. Try it both ways! Either way, it’s a winner. Melt the butter in small pan. Saute the onions until translucent and just barely beginning to brown. Add the garlic and saute for another minute. Add the mushrooms and sauté for 5 minutes until the mushrooms release their juices. Add the paprika, dill, salt and pepper. Set aside. Melt 3 tablespoons of butter and stir in the flour, constantly whisking for several minutes until the mixture is a rich, caramelized brown. 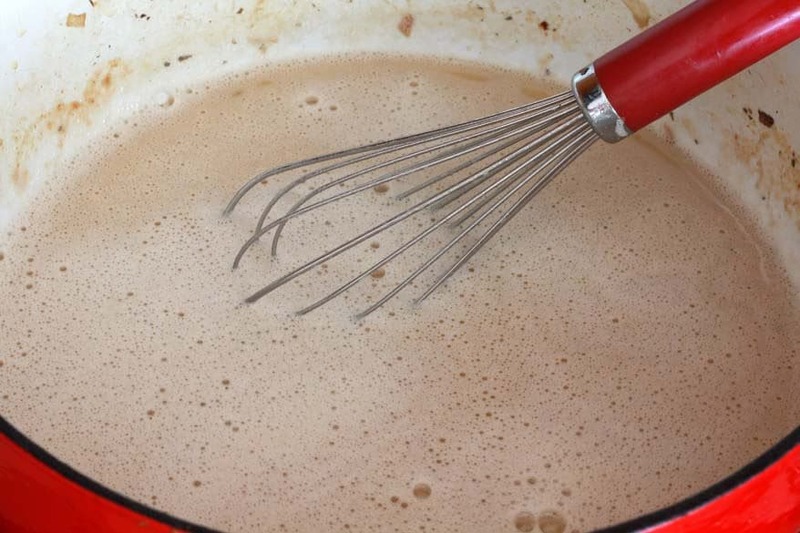 Add the milk, broth, and soy sauce, still whisking until the mixture is smooth. Add the paprika, dill, salt and pepper. Return the mushroom mixture. Bring to a boil, reduce heat to medium, cover and simmer for 15 minutes, stirring occasionally. Stir in the sour cream, simmer for another 2 minutes. Serve immediately with chopped parsley. Add a dollop of sour cream to each bowl if desired. Served with crusty bread. Melt 2 tablespoons of butter in small pan. Saute the onions until translucent and just barely beginning to brown. Add the garlic and saute for another minute. Add the mushrooms and sauté for 5 minutes until the mushrooms release their juices. Set aside. Melt 3 tablespoons of butter and stir in the flour, constantly whisking for several minutes until the mixture is a rich, caramelized brown. Add the milk, broth, and soy sauce, still whisking until the mixture is smooth. Add the paprika, dill, salt and pepper. 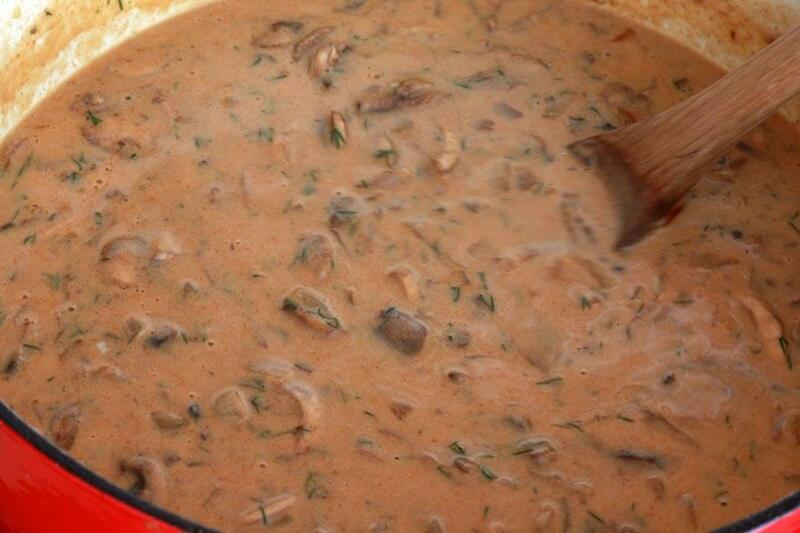 Add the mushroom mixture. Bring to a boil, reduce heat to medium, cover and simmer for 15 minutes, stirring occasionally. Stir in the sour cream, simmer for another 2 minutes. Serve immediately with chopped parsley. Add a dollop of sour cream to each bowl if desired. Looks really yummy, and I LOVE mushrooms so, I will definitely try this one. Thanks, Jeanie! Hope you enjoy it! Let me know how it turns out for you. I made it tonight. We loved it! So good, buttery and warming on a cold winters night. This looks delicious! I would love to try to veganize this recipe. Thanks, Lindsay. Veganizing would be a breeze. I would substitute organic canola oil for the butter (I love cooking with extra virgin olive oil, but the taste may end up dominating this particular soup), vegetable broth for the beef broth, non-dairy sour cream, and either hemp or rice milk (rice milk is very thin – if using that I would recommend increasing the amount of non-dairy sour cream to make for a more creamy consistency. This soup lends easily lends itself to a vegan version and will still taste perfectly yummy! Thanks, Lindsay! Veganizing this recipe would be a breeze! I would substitute organic canola oil for the butter (I love cooking with olive and coconut oils, but those flavors would most likely dominate this particular soup too much), vegetable broth for the beef broth, non-dairy sour cream, and hemp milk. Other milk substitutes, like rice milk, are much thinner in consistency. If using rice milk I would increase the amount of non-dairy sour cream to make for a creamier consistency. In any case, this soup lends itself easily to a vegan version and will still taste absolutely yummy! Thanks for stopping by! Made it last night and it was wonderful….Happy group! Next time Ill try it over egg noodles…but as a soup…I loved it (oh…used the vegi broth instead of Beef broth and it was still great! Thank you, Pam, so glad you liked it! In this cold, winter weather this soup hits the spot! Thanks for sharing such a tasty recipe! You are most welcome and thanks for giving it a try! Why on earth would you put soya suce in a Hungarian influenced mushroom soup? 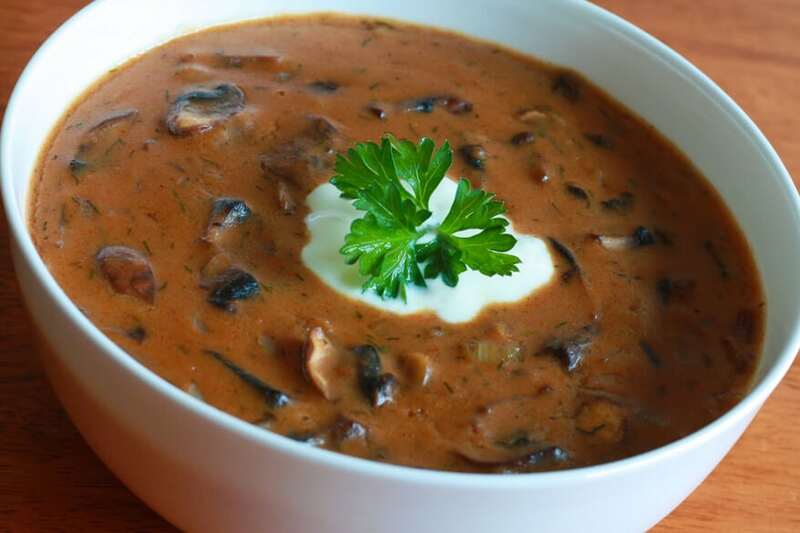 Neither soya sauce, nor butter have much to do with traditional Hungarian cooking, This is the second Hungarian mushroom soup recipe I find in which soya sauce is given as an ingredient. Skip the soya sauce, but use more galrlic, add savory and thyme. To make it a real winter treat: include some smoked bacon or ham. Hungarians love to put stuff like that into their rustic foods. Boletus, there’s a simple explanation: Because it tastes great that way! Make it as written and you’ll agree. It’s been a common movement in the world of cooking for years to blend culinary influences to achieve wonderful results. 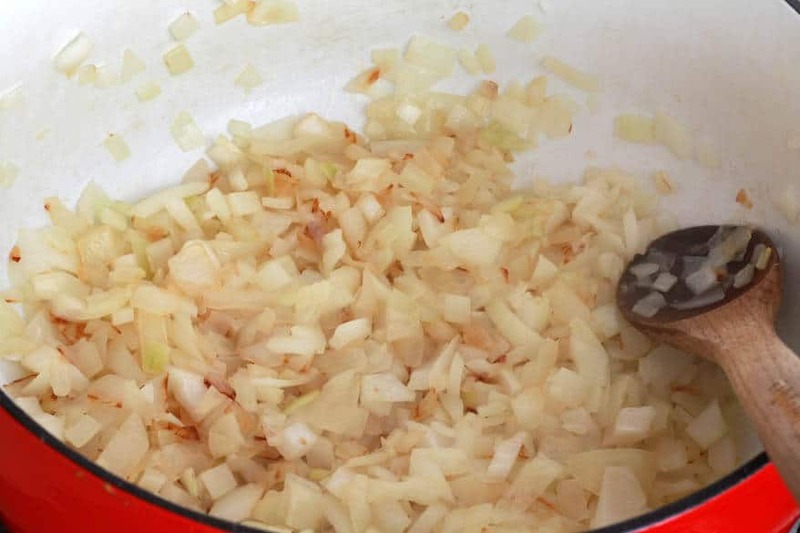 And using broth has been an even longer practice, especially when the soup is vegetarian and doesn’t have the flavor that would otherwise come from browning meat or frying bacon. On the point about bacon I agree with you whole-heartedly, there are few dishes that wouldn’t benefit from the inclusion of bacon – it’s a simply marvelous creation! The same is true of butter. And porcini mushrooms…yes! I’m a huge fan of adding some ground porcini to mushroom soups and sauces for flavor and several of my recipes do just that. They add such a fabulous flavor! I am aware of globalization affecting the way people cook and the ingredients they use and while “fusion cooking” is trendy and intreresting, I feel it is all the more important to really know the roots and to bring out the best from the authentic recipes with the use of limited “indigenous” ingredients. Yeah, I know, Hungarians would never have created their emblematic stews without the famous paprika, which was introduced to Europe from the Americas, but in our times it’s really worthwhile to try to taste and learn to appreciate more simple and well defined dishes connected to different regions of the world. Broth: yes, I know about this practice, sometimes use it myself ( though no cubes) but a really good mushroom soup will not really need this additive, Maybe I’m a purist but it is especially the trends brought about by fusion cooking that makes me one. BTW I am Hungarian, live in Budapest and think that your website hosts a wonderful range of recipes. Yes, I read that you’ve been visiting Hungary. The country info with the account of your personal impressions given in the introduction to your goulash soup recipe is quite touching and surely much appreciated by any Hungarian reading it. I see that you perhaps tend to adapt the recipes of ethnic foods a bit to suit the American taste (eg. butter instead of lard) and there is nothing wrong with that,it happens to recipes all the time, as they travel around the globe, it’s basically logical. While I might shudder at the thought of adding soya sauce to any Hungarian dish, it is true that one of the biggest joys of cooking is to experiment with different ingredients and new flavour combinations.I did note that the intro to the mushroom soup recipe said that the soup is Hungarian INFLUENCED (ie.not authentic Hungarian), so nothing misleading there either. Being vegan, I think it would be very hard to make this the “authentic” way. I’m making it right now and have high hopes. I made this for Thanksgiving! It was such a hit I am glad I saved some for myself. The flavor, the texture, everything about this soup is sublime. A keeper? Oh yes, that’s a no brainer! Thank you so much. So thrilled you made and enjoyed this, Global7! It’s one of our favorites. Thanks so much for your feedback! I’m half Hungarian, and I have made this soup for years, but no soya sauce!~ I also use chicken broths and a roux of butter and flour. Don’t use garlic because I think it might overwhelm the delicate soup. Hi Jane-Elizabeth! Contrary to what a lot of people may think, the soy sauce doesn’t add an “Asian” flavor. It’s simply a source of salt that adds some additional depth. This soup is made with a butter and flour roux as well and it’s whisked to a nice caramelized brown and then beef broth is added, so this version isn’t a delicate soup per say – it’s a very rich soup with a lot of depth of flavor and the garlic further enhances it. But absolutely, it you prefer to leave it out it will still taste fabulous. The same kind that evidently has more class and a better grip on vocabulary than have to resort to juvenile language. Cheers. Made this today and it was a treat! Used soy and almond milk instead of dairy and oregano instead of dill since it was all I had to hand, and cut the soy sauce, but it came out really great. Have been wanted to try something like this since I visited Budapest, the food I had there was so, so, good. Awesome, Molly! I know, Hungarian food is so good. If you click on the recipes tab on my menu bar you can search by country – I have a few Hungarian recipes you may be interested in. Your recipe made some subtle but nice changes with the original in Moosewood Cookbook: You sauté the mushrooms, too, before adding stock, you double the spices and add garlic. 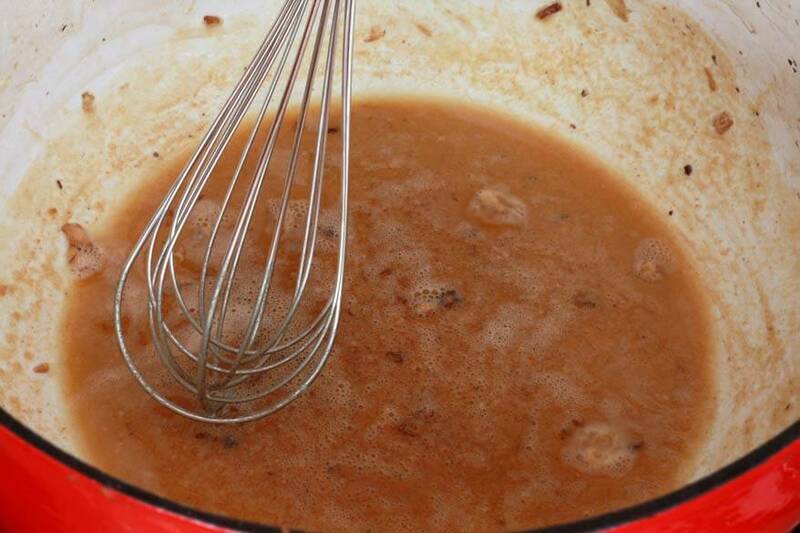 And, you make a darker Cajun-style roux (rather than a blond roux). I LOLd thinking “this blogger muse from the south and just couldn’t help herself.” :) Joking aside, it makes sense since the spices are sort of vaguely gumbo-ish… . You also leave out the lemon, which, again, makes sense since the sour cream already adds sour. These are both very good recipes! Thanks, Jonathan! I’ve never seen the Moosewood version but I’m happy to hear you approve of mine :) Ha, I’m not from the South but love the region and the food. Thanks again for the compliment, I appreciate it! Wonderful, Chavva! Thank you so much for the feedback and I’m happy to hear that you and your loved ones enjoy this as much as we do! Awesome, Kelly, I’m so glad you liked this soup, thank you! And I agree with your other comments! This was over the top delicious, the best mushroom soup we have ever had. Strongly recommend!! Wonderful, I’m so happy you enjoyed this, Carol, thank you! Oh boy, this sounds delightful. I’ll try this for my annual Bela Lugosi birthday celebration. Just made this and it is delicious! Soup came out lovely. However I did make a few adjustments, there’s no need for soy sauce as traditional Hungarian mushroom soups do not need it. 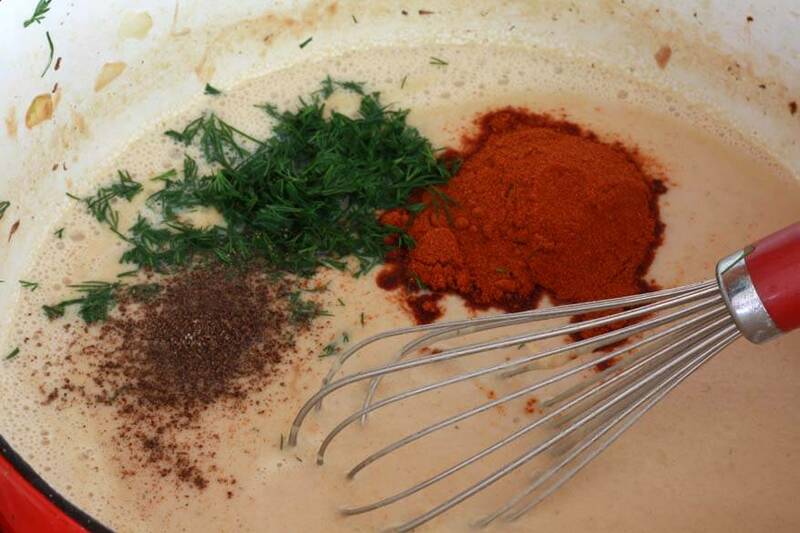 If it’s flavor you want adding more paprika along with dill adds nice flavor without that extra sodium. I added more pepper as well and didn’t use too much salt. I recommend pink hemalayian salt. It’s twice the flavor of your typical sea salt so not much is needed. I also added some cream and chose to use cornstarch instead of flour because cornstarch creates a creamier texture and blends better than flour. Spices are your friend don’t be afraid to use them to create a desired flavor! Hi Kayla, I’m so glad you enjoyed this – thank you! A few comments on your substitutions: 1) Soy Sauce: Its purpose is for a umami effect that you cannot achieve through paprika or dill. Plus there’s so little of it that it hardly impacts the overall sodium content of the soup. 2) Pink Himalayan salt: This is such a controversial product and has been found to contains a TON of sand which is a bad idea for your digestive system. Google it and you’ll find the info. 3) The role of the flour isn’t for texture, it’s for flavor, and its role us HUGE. The method of using it here is what the French call making a “roux”. 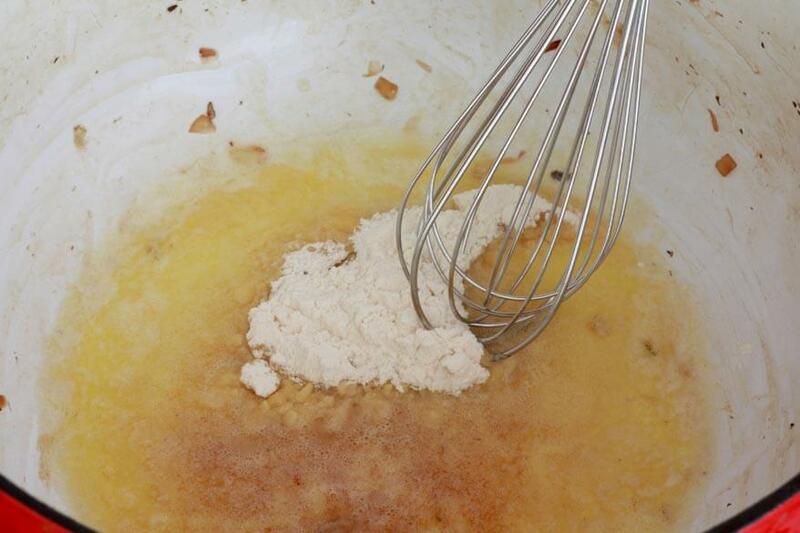 It’s not simply adding flour and then liquid, you caramelize the flour into a rich brown roux and the flavor is amazing. That’s the method used to make the best of the best beef stews, for example. Really, the next time you make this I encourage you to use the flour and make the roux, it adds 100% more flavor to the soup. All that said, in the end all that matters is that it tastes great to you, but I wanted to point out the reasoning behind the ingredients and methods used. I think I’d rather try Maggi over just soy – more European that way. What a fantastic recipe. I did the initial discussion onion sauté in 1 tbsp bacon fat and 1 tbsp butter, only cause I had cooked uncured bacon in the morning and so had it on hand. Also used chicken stock cause I had that on hand too. I’ve been on a Hungarian and Polish food kick. Stuffed cabbage and pierogies on the menu next week. 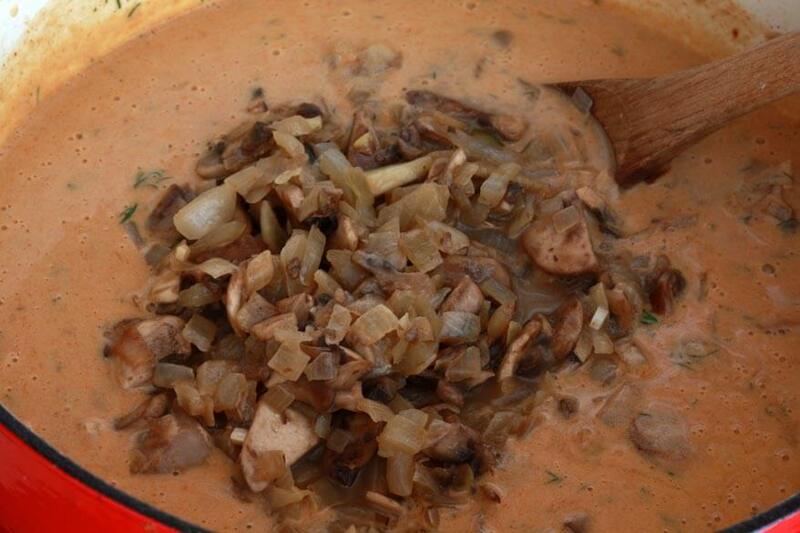 That’s a great kick to be on, Linda, and I’m so glad you enjoyed this soup – thank you! I’ve made this soup for years. Recipe from a neighbor in Buffalo, N.Y. It’s delicious especially on a cold winter day along with football games, of course. I usually make a large salad and a loaf of French bread, stuffed with spinach, garlic and butter – warmed in the oven. When in Florida I turn on the AC and do the same. Everyone loves it……….. This looks delicious. I will be making this as the weather starts to cool down more consistently. Is there any way I could add beef to this, particularly in small cubes? There was this amazing mushroom beef soup I had but cannot find a recipe anywhere. It wasn’t not thick or creamy. But the process was long as the beef cubes simmered in the pot for many hours until it was basically falling apart when finished. Perhaps there is a way with this? Hi Kito, this is a thick and creamy soup so even if you added beef it wouldn’t be what you’re looking for. I hope you find the recipe you’re looking for. Hi Anna, that’s correct and I state in my post that this is “Hungarian influenced”; it makes no claim to be an authentic Hungarian dish. Yes, that’s what I’ve named my recipe. Could you share her recipe? Fantastic, Joseph, I’m so glad it was a hit, thank you! I really made a fun mess of this, I had 4 portobella mushrooms I had to pretty much chop up for the soup, I had 4 small purple potatoes I peeled and diced small (needed to use, and have read potatoes can be incorporated into thus soup) I had too much left over chicken and beef broth (about 6 cups) one clove of elephant garlic I needed to use, I only had some fresh dill, with seeds that I harvested from my garden, it was dried. I did have an onion. Oh I also only had one “take out” packet of soy sauce, and I used it. Hungarian paprika is always around. I have fresh raw heavy cream and some fresh raw milk, I used. I adjusted everything to work out,and the soup was amazing! Sorry I changed it up so much but it goes to show you can really play around with a good basic recipe and still end up with an amazing dish! Loved it! Awesome, Luna! You cook the way I do – I grab whatever I have on hand that needs to be used up and somehow things usually manage to turn out :) Thanks so much for the feedback! I just made this for a soup supper and got several compliments. It was delicious! Can’t wait to make it again. Just made this soup for the second time! My family adores it. Thank you so much for sharing such a great receipe. Wonderful, Bernadene, I’m so happy to hear that, thank you! The photography and history were incredible but I wish you had labeled the photos with the name of each recipe as well as your name. Again thank you for sharing!!! Hi Judy, I’m not sure I understand. Label which photos? The step-by-step preparation pictures? I’m not sure what you mean by labeling each photo with the name of the recipe – these photos are all part of the same recipe. Thanks.